On Guide Professional and Enteprise, agents can use the Knowledge Capture app in the Support agent interface to create new articles using pre-defined templates. If a template does not exist, agents will not be able to create articles using the Knowledge Capture app. For information about creating templates, see Creating templates for the Knowledge Capture app. For information about planning your workflow, see Setting up your workflow for created articles. If you do not want agents to create articles using the Knowledge Capture app, you can disable that option. Click the Create Knowledge button in the Knowledge Capture app. If you have multiple brands, click the drop-down menu to select a Help Center. Agents can see and select only the templates where they have management permissions for editing. If you have not created any templates, you need to set up a template first (see Creating templates for the Knowledge Capture app). Add a title and content to the article, according to the headings in the template. Change the article's section, if necessary, depending on your workflow for new knowledge. Make any other changes you need in the article's sidebar. The author is automatically updated to be the agent creating the article. Click Save or choose another option from the drop-down. The article created is a duplicate of the template; it does not overwrite the template. The new article does not retain the KCTemplate label. From what I have seen, this part of the KC app misses the ability of copying the info from the ticket, as the "Ticket to Help Center" has. Or am I missing something? I'm with Niclas here. 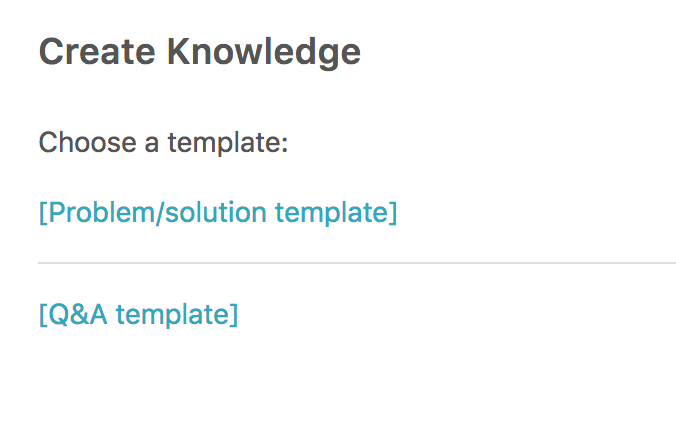 This "Create knowledge" button just opens a copy of a saved template, but it does not transfer the content of the ticket there. Is it up to the user to copy and paste the info? I was expecting something more automatic. You are right--the Create knowledge button enables you select a template created by your team. Then you have to manually add the content into the ticket. Sorry it's not more automatic at this point, like the Ticket to Help Center app is. @Jennifer - it's a great start. What I'm finding crazy is, if we create a new article from the app, we then have to refresh the app and search by title to link the ticket to the article we just created. I'm creating the article, I know that it's going to be linked to my ticket. If it's determined later to be a duplicate we can unlink/delete the article, but that's the exception not the rule. Any plans to enhance that? It's very disjointed. I've found that you agents are able to create articles from the KC app even if the section and articles are marked as draft. But light agents on the other hand are not able to create article even if the section and the articles (template) are published. Is there a restriction to light agent to being able to create articles from the KC app ? Does anyone have any advice? We're in a season of creating a lot of content. 1. When I create a new article from the KC App, I save and close the newly opened tab/window. When I'm back in my ticket, is the only way to find what I just created to search for it by name in the app? 2. If I instead rely on my approvers to link articles back to the originating tickets, how do they know the ticket ID it came from? Are agents supposed to manually type the ticket ID in the article they create? Anyway I look at it there seems to be a cumbersome step of linking the article I just created to the ticket it initially relates to. Anyone have any good solution for this? We've tried 3 different approaches and my agent find it very frustrating. Are there any plans for the Create knowledge button to automatically add the content of a ticket into the knowledge capture draft template? This seems like it should be a fairly standard thing for this app to do. The team has talked about that (automatically adding the content of a ticket in new articles though the KC app) as being a possible improvement, but there are no current plans to add it. I also think this would help us in the future. But, not an immediate need. Is there a feature request to push the last comment of a ticket into the KC app? the app isn't meeting the expectations of our team -- we thought it would at least copy the last comment or the entire ticekt contents into the article. As it is, the team is finding it very manual to write up a case into an article draft. 4. Agents navigate to a KB "queue" and find their article or someone else's article. Agent finishes article. 5. Agent routes article for review and approval. In it's current state, we're not finding the app to be that different than simply creating a new KB article directly on the portal. Doesn't really save any time or add much efficiency. I'd definitely like to upvote a feature request or create one. Thanks for your feedback. Can you post it in our Product Feedback topic? That way other users can vote on it and comment. Also, Product managers will see it, as they monitor feedback in that section. They might miss it here in the documentation. When you add it, share the link here, if you want, so users can go vote for it.